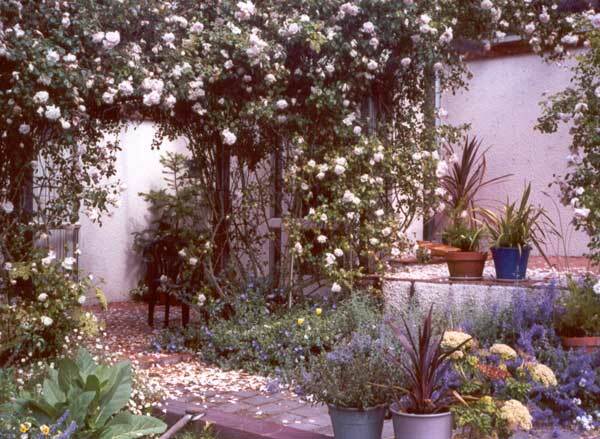 This photo from the archives shows the New Dawn climbing rose forming a beautiful archway and gently dropping its pale pink petals on the patio beneath. 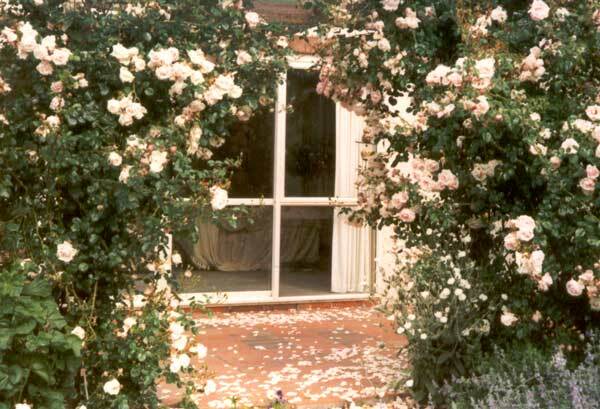 The roses on the house pergola used to start flowering in November, early summer for me. Someone had to sweep up the petals on the patio though, as they got very slushy after rain. That was a pity, as the idea of pale pink rose petals was very romantic. What was not so romantic was the rose disease called rust, which raged through New Dawn two seasons ago, with the resulting discoloured leaves dropping in a light mist of bright orange! The New Dawn rose arch was finally chopped down in the year 2001. I'm glad I have these photos to remember the good times.